Although Rockstar’s GTA games have surely been great on consoles, the PC editions have had the quite wonderful advantage of being modable. This means that players can change most aspects of the game, and even add completely new stuff to the likes of GTA V.
This has led to the release of plenty of interesting user mods, while there have also been some crazy concoctions such as one mod which turns a well-known brand of mobile phone into an explosive in the game… Also, another more ambitious mod aims to bring the entirety of GTA IV’s Liberty City to GTA V, which is surely no mean feat. And some modders have truly gotten creative these days, proof of this being JulioNIB’s Crysis mod for GTA V.
This mod is based on German developer Crytek’s 2007 hit game Crysis, a first-person shooter which was widely praised at the time due to its fantastic graphics and stunning action. The game takes place in the near future, with a group of US commandos being sent to a remote island which has been occupied by the North Korean army. In the game, players got to use a special nanosuit which granted them powers like extra speed, strength, cloaking and armour. 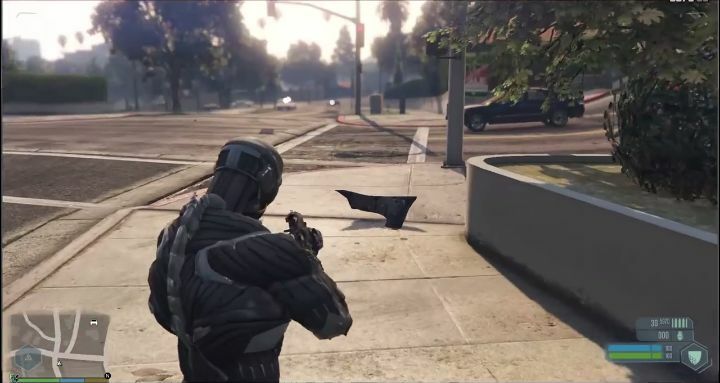 And this Crysis mod for GTA V not only brings the nanosuit to the game, but GTA V players will also be able to utilize the same powers as in the Crysis video game on the streets of Los Santos, as can be seen in the video above. And this will certainly allow gamers to cause even more havoc in GTA V’s fictional city of Los Santos, sci-fi style this time. Those curious to try the mod will find instructions on how to download it on dsogaming.com. As usual though, it’s always a good idea to be cautious when downloading and trying user mods for GTA V or any other game, even though this mod sure looks like it’s worth a shot for those wanting to give their GTA V game a different feel.